It's only been a few weeks since the lights went out for the final movie at Hayden Cinema 6, a locally owned and operated first run movie theater in Hayden. At the time of that businesses closing no mention was made of what might take over the space being vacated. However we have now learned the movie theater space won't be vacant for long, and will be occupied by, another movie theater. Mike Lenhosit of Boise has acquired the business and will re-open on June 7th but with a slightly different format. The new owner plans to operate the business as a second run discount movie theater. The new theater will use the name Hayden Discount Cinema and will charge only a 2.00 admission price for all movies shown. The new Hayden Discount Cinema will employ between 15-20 and will be open daily at noon. The new cinema will take over all of the former Hayden Cinema 6's space which can be found on the back end of the Prairie Shopping Center off of Prairie Ave in between US 95 and Government Way in Hayden. The theater is visible from Government Way nearby the Hayden Library. The owners have much experience with running movie theaters having operated similar businesses in Southern Idaho for many years. Ship It Now is a new locally owned & operated pack & ship mailing store located in Spokane Valley at 12510 E. Sprague Ave suite 2 . Because Ship It Now is a independent shipping store parcels can be shipped using either UPS, Fed Ex ,USPS or DHL instead of being only able to use one based on the stores branding. The Spokane office of HUD ( Housing & Urban Development, a federal agency) will close soon. The office is one of 16 nation wide to close. HUD plans to continue to serve the region however from an office in Seattle. The local office employed 5 ,those employees will either be offered a buy out or another job at another HUD office elsewhere in the country. Arrotta's Automax & RV is now open in the former Becker dealership space at 6623 N. Division St north of Northtown Mall in Spokane. The new dealership held a grand opening earlier in the month , The dealership has no brand affiliation and sells used cars,trucks,vans and suv's ,also the dealership has a selection of RV's . Arrotta's Automax & RV also advertises that they can make arrangements for even poor credit types. Spa Paradiso is far from a new business in Spokane, in fact the Spa spent several years as the Spa for the Davenport Hotel before moving out last year. Since Spa Paradiso left the Davenport has since opened it's own Salon and Spa in the basement space. But now Spa Paradiso is back open and among the first businesses to open their doors in Spokane's newest neighborhood, Kendall Yards. Spa Paradiso is in a new building in the development at 1237 W. Summit Pkwy. Suite A. Advertising itself as a resource center and retail store for expectant mother's, Bella Cova will occupy space in the historic Broadview Dairy building at 905 N. Washington St just north of Downtown Spokane and nearby the Spokane Arena. Harmonic Wellness Therapy is the first business in Spokane to offer a new therapy to reduce stress,pain and more thru to the use of a sound table. The new business is now open in Spokane Valley at 4319 E 15th Ave.
Aiming towards giving one an experience of high tea in a historic structure to re-live days gone by is the job of the newest tea house business in Spokane that opens sometime in June. A well known local cupcake bakery is attempting to become a bit more well known. Love at First Bite Desserts which is located at 11305 E. Sprague Ave in Spokane Valley recently began a push to have the owner , Monica Sanders and the shop on a future episode of the hit Food Network TV show, Cupcake Wars. Love at First Bite Desserts has quickly become one of the more popular bakeries in the Spokane area since it's opening in 2011. The Cupcake shop also does cakes and features at times more unconventional cupcake flavors. Vivo is a Coeur d' Alene based women's clothing and accessory retail chain. The chain has enjoyed much expansion in recent years going from 1 store on Sherman Ave in Downtown Coeur d' Alene to now also being in all of the Spokane malls and a clearance outlet store off of Sunset Ave in Coeur d' Alene. Rumors are also pointing towards Vivo possibly expanding into the Seattle market at some point in the future. Vivo has actually already opened their new store in the Tri-Cities. Vivo's new store opened in March and is located in Kennewick at the Columbia Square Mall across from the food court. The Spokane based grocery store chain, Yoke's is investing in a new store location in Richland. The new store is now under construction at 455 Englewood Dr. near Keene Rd in Richland. The new store will be a new construction with 55,000 square feet and employ around 100. Opening is planned for October of 2013. Fire Artisan Pizza is also expanding at rather rapid rate. The small chain of artisan pizza restaurants began only a few years ago with the opening of their original store on Sherman Ave. in Downtown Coeur d' Alene. In 2012 Fire Artisan Pizza expanded once more opening a store on W Sprague Ave by the Davenport Hotel in Downtown Spokane. And for store number 3 for the Pizza restaurant, Fire has chosen the Tri-Cities. The new Fire location will during the summer in Kennewick. The restaurant will be in a new construction building custom designed just for Fire. The restaurant will open at 1022 N. Columbia Falls Blvd. and will employ 40. Value Village, which is a thrift store chain operated by the Bellevue,WA. based Savers Inc. has made plans to re-locate their store at 13113 E. Sprague Ave. in Spokane Valley to space in the Opportunity Shopping Center at 12205 E. Sprague, at the corner of Sprague & Pines. The store will be in the plaza space that was last an Old Country Buffet. The unit and shopping center have sat vacant for the last few months and are now enjoying a bit of re-birth. A Global Fitness work-out facility has opened at the shopping center recently as well a thrift store and vendor mall/ thrift market farther down in the plaza. The space will be remodeled to fit the needs of the new Value Village store and some permits for the work have already been issued. The space is listed as being about 25,000 square feet and as of now there is no word on when the new Spokane Valley Value Village location might open. Value Village also operates a location in Spokane on W. Boone Ave directly across from the Spokane Arena. It may seem like Spokane is already home to enough mattress stores, but apparently the demand is still there prompting one more chain has opened it's doors in 3 new locations in the Spokane area. That chain is Mattress Firm, a Houston, Texas based mattress retailer with over 1,000 locations in 28 US States. The 3 new locations in Spokane area are the first for the chain in our region. All Spokane stores are now open, no word as of now if any more are planned. I admit I'm a bit late on this post but earlier this month the Spokane Public Facilities District, the body that oversees the operations of the Spokane Convention Center along with The INB Performing Arts Center and the Spokane Arena, meet and choose a new design and construction firm for a massive expansion that is planned for the Convention Center. The Spokane PFD chose the plans presented by Garco / ASLC / LMN . The expansion plans add 90,000 new square feet of space on the exhibit hall to make Spokane more market-able to shows and conventions, also the plans call for new meeting space and new support space. The expansion will also " highlight" the Spokane River. Construction work on the Spokane Convention Center expansion is expected to begin in August of this year. The expansion project is being funded via a sales tax and hotel/motel tax extension that was approved last year by voters. The funding also includes work at the Spokane Arena where the Spokane PFD will add 700 new seats in the upper levels of the Arena. That project is also expected to begin this summer and will make the Arena more marketable to shows and groups such as the NCAA. -A brand new free standing store in Airway Heights,The new Airway Heights O'Reilly Auto Parts store is now open and can be found at 10228 W. US Route 2 ,near by the Airway Heights Wal-Mart. A grand opening is to be held on May 17th. -A brand new store in Rathdrum. The new Rathdrum O'Reilly's Auto Parts store is also now open and can be found at 6613 W. Commercial Park Ave.
-A brand new free standing store in Smelterville (Silver Valley) opened in late 2012 at 581 Commerce Dr. near by the Smelterville Wal-Mart. While the local owners and local customer service of Jarms Hardware remain the same , much has changed at the local Hardware store located in Cheney at 6 Cheney-Spokane Rd. Jarms has been a part of the Cheney business community since 1972. Recently Jarms re-branded siding with the national ACE Hardware chain and officially made the new store name, Jarms ACE Hardware. Previously the store had been affilated with the True Value Hardware system. Along with the new name came a new remodel of the store, the remodel is now complete and grand opening was held in early May. The Silver Lake Mall in Coeur d' Alene now has a coffee shop / bakery in the mall. Sweet Moments Bakery is now open in the food court are next to the new Sports Authority store. The Copa, a upscale restaurant and bar that had been located at 9265 N. Government Way in Hayden has closed. The Copa lost a lot of it's business from bad publicity created when the owner former Idaho State Senator Mike Jorgenson was accused of assault against a employee of the restaurant. Rumors have surfaced however of a re-opening, probably by another owner but no word as of yet. It's probably one of the saddest business closings I've had to report but the Hayden Cinema 6 which was in the Prairie Shopping Center off of Prairie Ave. in Hayden has gone out of business. The cinema's last show was during the last weekend in April and the Hayden Cinema 6 was one of the last independent locally owned and operated movie theaters in the Spokane / Coeur d' Alene area,especially showing first run films. Hayden Cinema 6 is not expected to re-open and no word as of yet as to what will happen to it's large anchor space in the shopping center. While it may sound like good news that the IRS is going out of business, it's not. The Internal Revenue Service is planning on closing it's Coeur d' Alene office and merging local area IRS operations into the office in Spokane. The Coeur d' Alene IRS office had been located in the 1200 Ironwood Dr. office building that once also housed the Idaho Dept. of Labor which has since moved into it's own building in Post Falls. Shine, a full service salon in Midtown Coeur d' Alene has moved into a more visible space. Shine remains in Midtown but is now on N. 4th St. in between Junk's boutique retail shop and the Eric Hedlund Design offices. Goldwater Bank has moved their Coeur d' Alene operations into Riverstone. The bank's local offices are for home mortgage loans and are part of a larger bank with locations elsewhere in the West. Goldwater Bank at Riverstone is located in the former Condo Sales Center offices next door to The Mill Public House off of Old Mill Loop. After 27 years of occupying the same retail space inside the main entryway to the Coeur d' Alene Resort, Coeur d' Alene Galleries Art Gallery has relocated and is now in a larger location directly on E. Sherman Ave.
Coeur d' Alene Galleries is now open in the former JAMMS Frozen Yogurt space at 213 E. Sherman Ave. . The Gallery features a variety of Art with a major focus on western art. Taking over the space being vacated by Coeur d' Alene Galleries is the Art Gallery's former neighbor, The Resort Logo Shop. The Resort Logo Shop is expanding into the empty space and will continue to sell the same items as it does now only with a larger selection. The Coeur d' Alene Resort Logo Shop features local souvenirs as well some convenience store items. -New apartment complexes now under construction at Ramsey and Lopez, in The Landings subdivision and 2 new apartment projects on Seltice Way nearby Mill River. -A new assisted living community under construction near by the intersection of Ramsey and Kathleen. -A new McDonalds under construction in Riverstone at the corner of Lakewood and Riverstone Dr.
And many many more.... For more info on these projects search for them on this site and keep watching as I will try to get as many project updates on as I can. Silverwood opens Silverwood Coffee Roasting and Trading Co.
Silverwood Theme Park's Summer 2013 season is officially open with the sprawling amusement and water park open on Saturday's and Sunday's thru the month of May and then with extended day and hours later in the summer. However the 2013 Silverwood season won't be exactly like the last as their are a few new things are coming to the park this year. In this article we are looking into the new Silverwood Coffee Roasting and Trading Co. which opens to the public this year adjacent to the main park gates. The new shop allows for Silverwood to roast their own coffee, a process which customers of the new shop will be able to watch. The new coffee shop will also carry baked goods like fresh cinnamon rolls and muffin tops. The Silverwood Coffee Roasting and Trading Co. will function as a retail gift shop for park apparel, souvenirs and the like. Here is our periodic look into some recently issued liquor license's around the Spokane area. This gives a better look into what new restaurants and market's may be coming to the area. However it is important to note some may just be adding liquor and could already be in business, also some may change names before opening as some are place holders and in the name of their parent company. Spokane A list, a website that is part of the Cityvoter network has launched an online contest to see which Spokane Food Truck / Food Cart is the best. While Spokane / Coeur d' Alene may not have the huge food truck followings like Portland and other US cities do. The contest is proving that the food truck business in our region is growing and getting stronger. The contest is already in it's second round and semi-finals and finals will begin on May 14th. The remaining trucks in the Spokane A List Food Truck Fight are: The King of Tacos, Scoop Ice Cream , Toby's BBQ , Veraci Pizza , Log Cabin BBQ , Tacos El Sol, Best Sandwhich Shack and The Jamican Jerk Pan. Coeur d' Alene Sports Authority now open,grand opening soon. The newest Sports Authority store is now open in Coeur d' Alene. The new store is an anchor tenant for the Silver Lake Mall at 200 W. Hanley Ave in-between US 95 and Government Way on the north side of the city. The store officially opened to customers on May 10th and will host an official grand opening celebration on Saturday May 18th. The store is a brand new location for the large multi-state sporting goods chain and occupies about 44,000 square feet of the enclosed shopping center. The space was last occupied by Timberline Trading Co who has since moved into other space in the mall and partially consolidated with it's parent store, Black Sheep Sporting Goods. The new Sports Authority store's grand opening will occur on May 18th beginning at 8am. Included in the festivities will be a special appearance by Seattle Seahawks wide receiver Golden Tate. Tate, will be at the store on Saturday afternoon from 1 - 2:30 pm. Also the first 250 customers in the door will receive Sports Authority Scratch and Win cards that are good for anywhere from $5 up to $500. Drawings for $100 gift cards will also be held hourly from 9am - 6pm the day of the event. The new Coeur d' Alene Sports Authority store utilizes a newer store layout that the company has found success with in other stores. The new store is spacious and has in store specialty sports shops that assist customers in finding what they are looking for. Sports Authority is chain sporting goods store with over 450 locations scattered thru out 45 US States. The company operates from headquarters in Englewood,Colorado. Sports Authority also operates 2 stores in the Spokane area, near Spokane Valley Mall on Indiana Ave. and in the Northpointe Shopping Center in North Spokane. The Spokane economy is sure showing signs of hope as yet another historic Downtown building has been sold and will be re-opened. The Buchanan Building at 28 W. 3rd Ave was recently purchased by local businessman and city council member Steve Salvatori. Salvatori is also the owner of the local business incubator, Spokane Entrepreneurial Center which has 2 buildings already elsewhere in Downtown Spokane. The Buchanan will become new office space and a portion of that space has already been committed to be leased by the Spokane based database developer LimeLyte Technology Group. LimeLyte's CEO will assume the role of building manager and the database company will occupy about half of the main floor of the building. LimeLyte is expected to move it's offices in sometime around June. The remaining open office space in the Buchanan will be leased out, The building will offer 9 basement level offices and 2 office spaces open on the main floor. The building maybe historic but that doesn't mean it's office tenants can't enjoy the modern conveniences of a card control entry system, high speed Internet and phone , a conference room and more. Parking passes will also be available for building tenants. Former Johnston Printing building in Downtown Spokane,sold to be re-purposed. The Downtown Spokane building that once housed Johnston Printing, until that firm closed in 2011, has been sold and will soon be re-modeled and repurposed into a multi-tenant office building. The building is located at 159 S. McClellan St by the corner of W Pacific Ave. and S. McClellan St. in a historic neighborhood with a storied past of warehousing and industry due to the nearby access to the rail viaduct and the Spokane Intermodal Center. The building was purchased local businessman Steve Schmautz, The new owner says he has already pre-leased about half of the project to 2 office tenants but has not named the businesses that have committed to the new space. Remodeling of the historic structure will be extensive and is expected to begin in the near future as current proposals call for having the site ready for occupation in about 6 months. 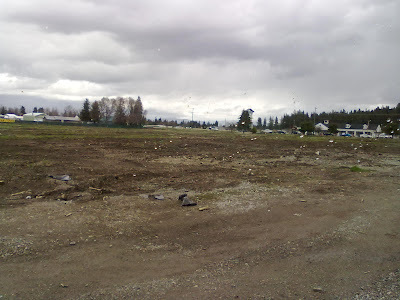 Where once stood the El Rancho Mobile Home Park at the corner of Highway 41 and Mullan Ave is now... nothing. While the site does have a few trees and remnants of the parks former streets are still visible, the homes that we're considered a well known eyesore are now all missing. But what, if anything , will replace the prime site on Post Falls' eastern edge? The answer is a lot! The mobile homes we're removed slowly over the last few months by the site's new owner, Spokane developer and real estate broker , Rod Plese . Plese has already began some marketing of the property which clocks in at a little over 8 acres via his family real estate business Plese Realty. Plese plans to fully develop the site for a commercial use. The site will one day become a new shopping center with a big box retail tenant proposed . As far as who will be tenants for the site, so far no businesses are able to be announced as coming to the shopping center site. But rumors have been heavy as to who it may be, so far the names of Safeway, Yoke's and even Winco have surfaced in the rumor mill but nothing coming from anyone in the authority to announce a tenant. The site will also contain smaller businesses in addition to the big box grocery or other store. A gas station, bank or resturants are also possible. There is no set timeline for construction as of yet but work should begin in the near future. Keep with Inland Northwest Business Watch for more as this project develops. Taken April 2013 by Inland Northwest Business Watch staff. Coeur d' Alene Mining moving to Chicago,to change name. After much speculation it has been confirmed that the large Coeur d' Alene based, Coeur d' Alene Mines Corp. will move it's headquarters and all operations out of the city later this year. Coeur d' Alene Mines, which has had it's home offices in the North Idaho city since 1985 and a local history that goes back many years before 1985, will close up shop in Coeur d' Alene in September 2013. The company will relocate it's headquarters to a yet to be named location in Chicago. Along with the companies move out of Coeur d' Alene the company will change it's name to Coeur Mining. The name change is expected to take place in mid-may following to companies annual meeting. Locally Coeur d' Alene Mines employs 65 in it's headquarters which are located on Front St facing McEuen Park in Downtown Coeur d' Alene. All of the companies headquarters employees we're offered jobs at the new offices in Chicago, of which only 20 accepted meaning the company will lay off the remaining 45 once the move occurs and re-hire in Chicago. Coeur d' Alene Mines has no plans as of yet as to what it will do with it's 4 story lakefront view office building. Coeur d' Alene Mines Corp. is a international mining operation with mines and active mining exploration in both the United States and several other nations around the world, world-wide Coeur d' Alene employs over 2000 . The company says their reasoning behind the move to Chicago is Chicago is a more pro-business city, an international shipping hub and it will allow the company better access to it's mines and key shareholders. Although speculation and rumors on the streets from residents of Coeur d' Alene point to the companies CEO, Mitchell J. Krebs is a native of Chicago and may have planned this move to his home town earlier in his career with Coeur d' Alene. This however cannot be confirmed. Coeur d' Alene has so many thrift stores that I had once heard a fellow blogger mention that the Coeur d' Alene area should try and promote itself as a Thrift Store capital of sorts, which I strongly agree with. And while over saturating a market with a particular type of store isn't always the best thing to do, in Coeur d' Alene's case the thrift store concept appears to still be a red hot business idea. One sign of the local success of Coeur d' Alene's thrift stores is the recent opening of a brand new store called Shopadily CDA . Shopadily CDA was born out of the Shop and Swap CDA Facebook group a page where local residents and store owners can post their items for sale. In fact many of the items for sale in the new Shopadily CDA store are also posted on the Shop and Swap CDA page. Shopadily CDA is located on the north side of Coeur d' Alene in the suites 3 and 4 of Sunup Plaza shopping center building at 6055 N. Government Way. Only a couple of blocks south of Silver Lake Mall. The stores regular business hours will be Tuesday thru Friday 10am till 6pm and Saturday 10am till 3pm. Shopadily is a non profit thrift store and donations are accepted. Profits from the store go to benefit The Coeur d' Alene Vikings Booster Club and Educational Foundation. Spokane's The General Store is in a round about way expanding it's local reach. A new ACE Hardware store will open soon in Spokane Valley owned and operated by The General Store's CEO Bruce Barany and will feature some of the same product selections as The General Store due to that store's affiliation with the ACE Hardware chain. But the owner and product lines is about where the affiliation between the main store and the new ACE location ends. The new Spokane Valley ACE Hardware store will be located in the a newly renovated building at 1330 N. Argonne Road nearby the intersection of N. Argonne and Sinto Ave. . The building was once home to Spears Furniture until a disastrous winter storm caused the roof of that store to cave in about 4 years ago. The new store will employ 10 and is expected to open sometime in May. Ace Hardware is a Chicago,Ill. based chain of hardware store with many locations already in the Spokane and Coeur d' Alene area including the fore mentioned General Store on N. Division St. near N. Foothills Dr. in Spokane.